Photos & Press release below by Team Malingri. We waited till having their official press release and confirmation to post the news. Vittorio and Nico Malingri have broken the previous Dakar-Guadalupe record on a 20' Cat specially designed by Balance Arquitectura Naval. Special cruising cats like the one used by the Malingri Team offers a bit more stability and a rather safer ride than coastal beachcats. I've built 3 special cruisers with our first f18 hulls, we added 3mts beams , wings , rollers furler jib / spi and even one for reefing the main over the boom. 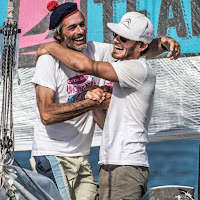 They are being sailed on our Patagonian Coast and the guys have endure some storms and tough days, but nothing can compare to these two brave sailors crossing the Atlantic. Other 'nuts' in the same league are Beto Pandiani and Yvan Buurgnon. Check Beachcat Cruising label for more cruising posts. 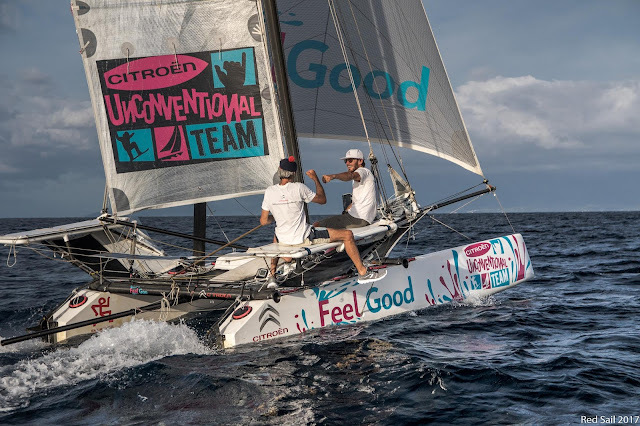 TEAM MALINGRI BEATS THE ATLANTIC RECORD ONBOARD “FEEL GOOD” (CITROËN) IN 11 DAYS 1 HOUR AND 9 MINUTES. 10 hours and 16 minutes less compared to the record time earlier held by the French duo Moreau and Lequin. After a long and exhausting sailing on a non-inhabitable six feet long beach catamaran, Vittorio and Nico made another big adventure and brought the record back in Italy. leaving Dakar, they immediately started on a straight line heading hundred miles south of Praia Island, Cape Verde, covering 285 miles in the first 24 hours (25 miles ahead of expectations). According to Navimeteo's advice and precise predictions, they decided to move to a lower latitude, around 12 N, to maintain a steady wind and avoid too many stunts and a very small, lightweight bubble. Therefore the strategy of the team was to go south to where the trade wind was blowing at about 15 to 20 knots, to then haul off to create more apparent wind in the low wind stages, correcting the route directly to Guadeloupe. On the sixth day they had a slowdown initially due to the risk of a collision with two whales, fortunately avoided, and then capsized which forced them to swim to recover anything that had fallen into the water, including batteries and electronic navigation instruments. Finally, Sunday, April 16, Easter Day, they rushed to the north, facing the wind that in the seventh and eighth days blew around 5 ENE knots, slowing Feel Good's sailing. Once they left the bubble behind, with the anti-cyclone reinforcement and wind from NE around 15 knots, Feel Good begins to sail, even to fly, as Vittorio says "as a ball of fire!" Touching 12-13 and even 14 knots, plotting on the big waves and thus gaining over 100 miles. As expected, another difficult phase close to the island, where the trade winds characteristic ripples can sometimes cause very strong gusts and change of direction. About 200 miles from the arrival, in fact, another moment of great suspense: they capsized again, which forced Feel Good to stay still for more than half an hour. Then, finally, the resumption of navigation to an average of about 11 knots. However, it is not over yet: pursued by the blaze in the last 24 hours of navigation, Vittorio and Nico head north to the latitude of Guadeloupe to reach Point-à-Pitre with a couple of stunts. They navigate just over 6 knots, losing and recovering hopes several times. "A palpitation finale," says Vittorio, the last 100 miles in about 14 hours, a tough record gained from start to finish, with no gifts and no luck. For the duration of the journey they never gave up on fatigue, or felt down, Feel Good is their home and they enjoyed every moment of this beautiful journey in the ocean: "Like surfing a giant wave that never ends" (Vittorio). Carlo Leoni, Communications and External Relations Director of Groupe PSA: “Great Malingri. Another record gained greatly, after the one in 2016 in the Mediterranean, from Marseille to Carthage. Vittorio and Nico wrote another important page in the sport history of sailing. We are proud to have sustained and supported them in this adventure. A challenge that is perfectly in line with the spirit of Citroën, which is the most unconventional and audacious of the entire world of automotive. Bravi! "This adventure, from a meteorological point of view, has been fascinating and technically interesting. The decision of the right moment to leave was hard to take and the finding the “right window” was crucial. Uncertainties were numerous, the anticyclone was the great absence and this was a rather abnormal situation. The sailing back up north was the most critical moment where the risk was losing the accumulated advantage. 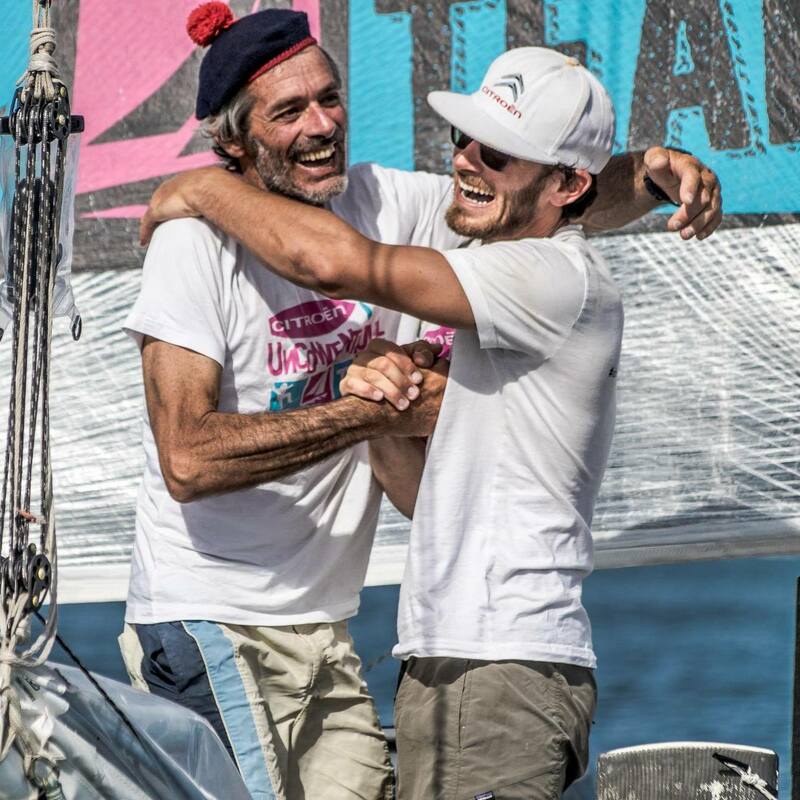 Nevertheless, Vittorio and Nico managed to make Feel Good sail very well. A record requires concentration up to the last mile. Bravo Vittorio, Bravo Nico. " 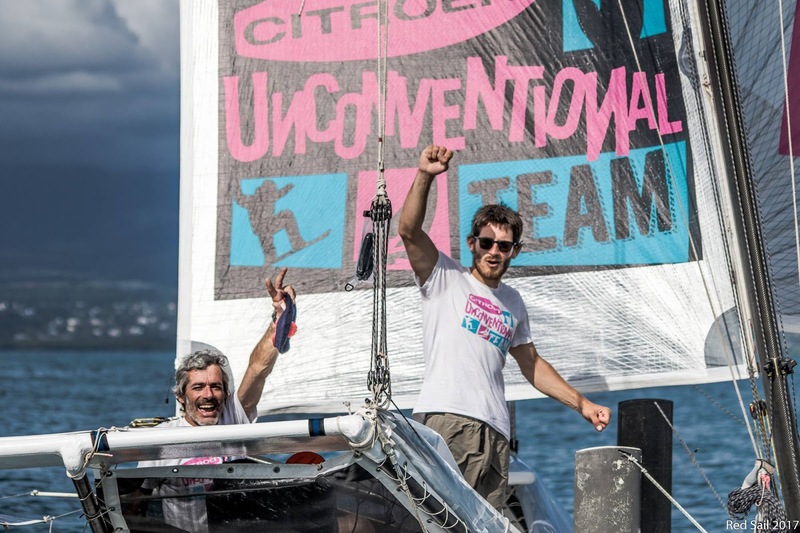 To follow the adventures of CUT (Citroën Unconventional Team) adventures visit their website.